Not sure what went wrong here, but season 2 gets my lowest average score. We’ve got the solid pairing of Doctor 10 and Rose, whose relationship is so well developed that their eventual parting in Doomsday brought genuine tears to my eyes. This is also comfortably before the RTD era began to descend into bombast and excess. Ultimately, it seems (for me, at least), the season is brought down by scripts that are either weak, average, or downright disappointing. New Earth: a perfectly good story, and a good introduction to the new dynamic between Rose and the Doctor (as opposed to The Christmas Invasion, which served primarily to introduce the new Doctor and Rose’s struggle to adjust). Tooth and Claw: the obligatory historical episode, and the one that makes me wish Tennant kept his native accent for the series. While not an outstanding episode, it’s a solid, gothic drama with enough decent moments to get an above average rating from me. School Reunion: I remain slightly disappointed by this outing, mainly due to a few plot holes and the loss of Anthony Head as a possible casting choice for the Master (he is superb here, but completely wasted as the chief villain in the secondary plot of an early-season episode). However, the gut-wrenching exploration of what it means to no longer be with the Doctor is another fine example of what sets the new series light years apart from classic Who. And Sarah Jane! The Girl In The Fireplace: this loses a point because I refuse to believe that the Doctor would abandon Rose the way he does in this episode. That misjudgment excepted, this is the new series at its best: chilling yet elegant monsters; another novel twist on the perils of being a time traveller; and a female character who’s at least a match for the Doctor. Rise Of The Cybermen/The Age Of Steel: not a bad story on its own terms, but as a reboot of the cybermen it’s mediocre. It carelessly throws away the concept of gradual slow dehumanisation that made them scary in the first place, and sets them up as little more than henchmen for a poor clone of Davros. It deserves a bonus point for the chilling scene of the female cyberman regaining her memories … but it’s not getting it as this two-parter should have been so much better than it was. The Idiot’s Lantern: some great period touches here, and a bold, interesting character with the bigoted father. The business of stealing faces could have been quite scary, but is ultimately undermined by not really making a whole lot of sense. The Impossible Planet/The Satan Pit: an episode that works so desperately hard to be an authentic sci-fi horror story that it succeeds in nothing more than being a poor copy of a sci-fi horror story. I know there’s a lot of love out there for this one, but for me it risibly fails in its ambitions. This is Doctor Who as if brought to you by Paul W.S Anderson. The second part gets a higher score due to the intriguing interaction between the Doctor and the devil. Wish there had been a bit more of that. Love and Monsters: a brilliant idea wasted on an episode that leaves a worse taste in your mouth the more you watch it. Fear Her: again, a good premise wasted on a sub-par episode. About the only bit I remember from this is the Doctor lighting the Olympic Torch – and that’s only because it was so painful to watch. Army of Ghosts/Doomsday: while the ghosts plot is ultimately a bit ridiculous (why would people assume those shadows were benign, dead relatives?) the build up through the first episode is note-perfect, leading to a OMG fist-thumping WTF cliffhanger that the show will probably never top. 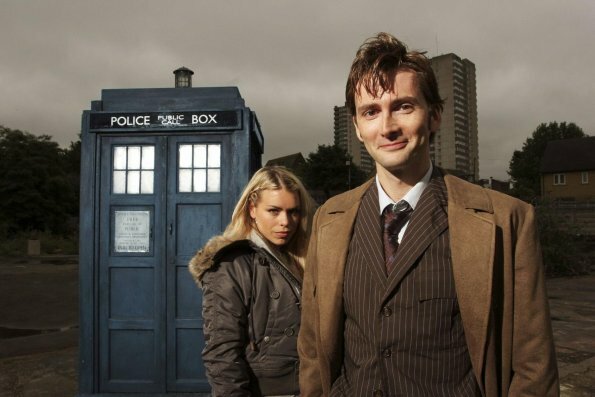 The second episode barely lets up until the final scenes, in which the work that Tennant, Piper and Davies have put in throughout the season really pays off. Just one question: if the Doctor needed to pull both levers simultaneously to re-open the void, why was he so desperate to send Rose away…? Who was he planning to get to pull that second lever? The Runaway Bride: I was really excited about Catherine Tate being in Doctor Who. Unfortunately this was the first episode I openly hated because they gave her such a terrible, crass, grating character to play. Whatever merits this story might have, there are few things on this planet that would ever persuade me to give it a second viewing.